Mangaluru, Mar 29, 2015 : Dakshina Kannada district has completed the survey on demarcation of deemed forest and revenue land and submitted its report to the government. It thus became the first district in the State to complete the survey. 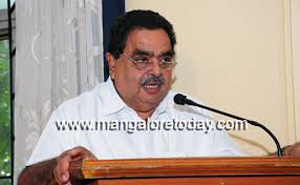 1.70 lakh acres earlier identified forest land will be handed over to the revenue department, District-in-Charge Minister Ramanath Rai informed. Speaking at the KDP meet here he said many long conflicts between the Revenue and the Forest Departments could be solved with the completion of the survey. The 1.70 lakh acre land did not have any features of a forest. The survey also found 46,255 acre Kumki, Bana and Devarakaadu land. "Once the land is handed over to the revenue department, it will be responsible to see that the land is not encroached and is used for purposes leagl," he added. Stating that the cabinet sub- committee will take a decision on Kasturirangan committee on conservation of Western Ghats soon, the Minister said that 46 villages in 35 gram panchayats in the district have been included in the list of ecologically sensitive areas where more than 20 per cent of the area is natural landscape. The State government will give priority to concerns of the people in its report to the Union government on the recommendations of the Kasturirangan panel on conservation of Western Ghats. DK DC, Adoor B Ibrahim said that special gram sabha has been conducted in 45 villages to collect opinion from the public on the report. The villagers have opposed the report and it will be checked further.